AFC Fylde have completed their sixth signing of the summer with attacking winger Ashley Hemmings joining from fellow National League side Salford City. The 27-year-old has signed a two-year deal and will be a further addition to Dave Challinor’s attacking options at Mill Farm. Hemmings started his professional career with Wolverhampton Wanderers before moving around the leagues playing for clubs including Plymouth Argyle, Walsall, Mansfield Town, Dagenham and Redbridge and Torquay United. He had only joined Salford at the end of May, becoming the fifth player signed by their new manager, Graham Alexander. 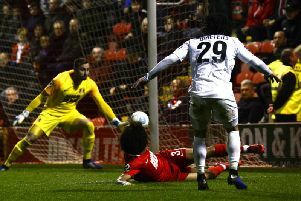 Nevertheless, Hemmings thanked Salford City for taking him to the club, saying: “I’m at the age of 27 now and I want to be playing most weeks. “I found out on Saturday that Fylde were interested. The midfielder scored 16 goals in 41 appearances for Vanarama National League North side Boston United last season, catching the eye of the newly-promoted Ammies in the process. When asked if he believes that kind of goalscoring form can continue he said: “Definitely, that’s what I play football for. The club has also announced that their National League fixture against Harrogate Town on Bank Holiday Monday, August 27 has been selected by BT Sport for live broadcast on BT Sport 1 and 4K UHD. The match at Mill Farm (5.15pm) will be the third time the Coasters have played in front of the TV cameras. That follows on from last season’s game against Barrow and their FA Cup tie against Wigan Athletic.